Stop doing wrong, learn to do right, encourage the oppressed! 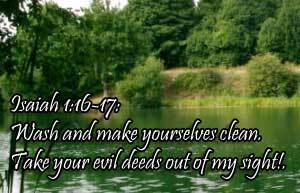 Isaiah 1:16-17: Wash and make yourselves clean. Take your evil deeds out of my sight! Stop doing wrong, learn to do right! Seek justice, encourage the oppressed. Defend the cause of the fatherless, plead the case of the widow. Today's verse defines what God does and instructs us to live in the same way. Whether it is Jesus defines his ministry in Luke 4:18-19 (The Spirit of the Lord is on me, because he has anointed me to preach good news to the poor. He has sent me to proclaim freedom for the prisoners and recovery of sight for the blind, to release the oppressed, to proclaim the year of the Lord's favor.) or James talking about the kind of piety that pleases God (Jas. 1:26-27), we must realize true faith is treating others as God would. Do you find it easy to replace service to those in need with religious rituals? I know I do! But God wants us to not get so caught up in talking about him and celebrating his deeds, that we forget we're suppose to care for others like he does. O Loving God of mercy, open our eyes today to see those who need your love and give us the attentiveness, care, time, and compassion to serve them. May Infant Jesus' work be seen in our life today and every day. Amen.